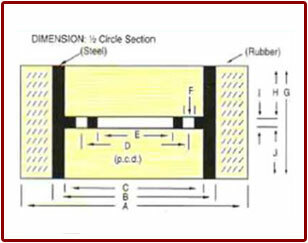 The following sizes represent some of the different types of Rubber Rolls being manufactured by us. Other sizes can also be manufactured and supplied as per the requirement of customer. S. No. DESCRIPTION OD mm. ID mm. LENGTH mm. Durable: Made out of Acrylonitrile Butadiene Rubber Compound selected for its oil and abrasion resistence properties, to give better yield and output. Properly compounded Rubber that provides Strength, Resilience, Temperature Resistance, Durability, Flexibility and Capacity to withstand various mechanical forces. Bonding Ability: High bonding ability guarantees, no bonding failure from metal to rubber. Heat Resistance: Rubber Material are scientifically cured to ensure high degree of heat resistance and have low thermo plasticity and ensure maximum durability. Shelling Efficiency: 90% Brown Rice can be made out by one pass with less broken Rice. SIZE DMR 10" DMR 10" JUMBO 8" x 8.3/4" 6" x 8.3/4" 4" x 8.3/4"
Always use proper mandrel / sleeve for the fitting of rolls. Keep the roll straight while fitting to avoid damage. In DMR type centre plate should be matched properly and tightened equally. While fitting DMR rolls, welding portion / Rib portion should be on operator side. 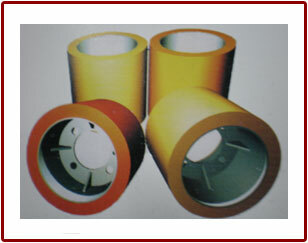 Avoid very high pressure on the rubber rolls. High pressure may cause heat build-up and failure. Ensure proper air curculation during use. Never run rolls on pressure without paddy. Ensure proper flow of the paddy on rolls. Improper flow will cause lining on surface of the rolls.